Among the many ancient underwater ruins in the world are the former seaport towns of Aperlae, Dolchiste and Teimioussa, one part of a complex of communities linked to the old villages of Kalekov, Ucagiz and Simena, Turkey, on the Medditeranian Island of Kekova. 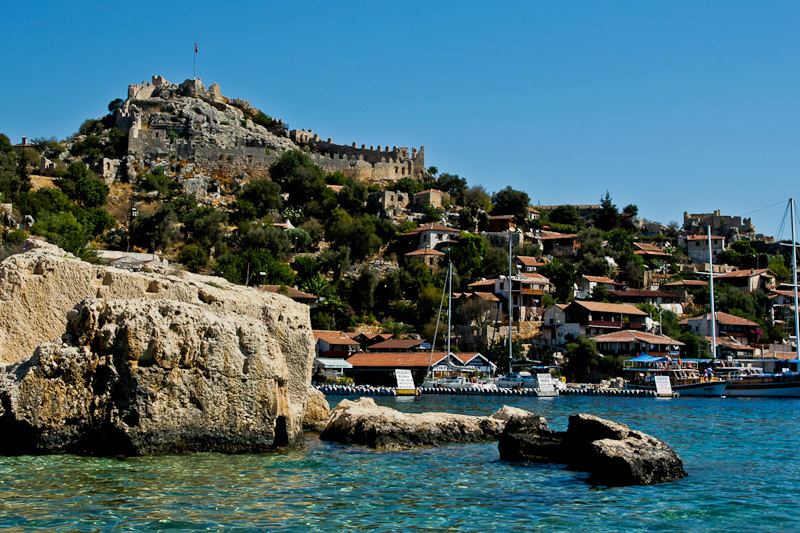 The Kekova region is a popular tourist attraction today because it is laced with partly sunken ruins and even a castle. The ruins extend up into the rocky precipice that overhangs the coast. The island is about 100 square miles in size and lies just off the coast of Turkey. In the Fifth Century, Kekova was the primary seaport for the the kingdom of Lycia, which existed on what is now the southern coast of Turkey. Eventually it was conquered by the Persians, then later the Romans. Before this, the people of Lycia spoke their own language during the time that kingdom rose up during the late Bronze Age. Because they were on a seafront, the people of Kekova and the adjoining communities were known as ship builders. They traded with other ports along the Medditerranean and extensively with the Greeks. At one time Lycia had its own fleet of warships and fought in various wars at sea. That nation's history and its kingdoms was long and complex. Because they were frequently invaded by adjoining kingdoms and pirates, the cities were well fortified. The port towns of Simena, Kalekoy and Ucaqiz still stand today, but the others fell to partially submerged ruin after the region was ravaged by a series of earthquakes. Tourists who cruise along the coast can look down through the crystal clear waters to admire the ruins of buildings and walls below. Simena no longer bears its original name. Today it is known as Kalekoy and it is known for its partly sunken ruins and also a castle. In fact its name, Kalekoy, means "castle village." The castle is well preserved and towers above the community. It was built by the Knights of Rhodes and contains a small amphitheatre within.